From left are Federation President Jimmy Parnell, Cullman County’s Jeremy Calvert and Federation Horticulture Division Director Mac Higginbotham. MONTGOMERY – More than 600 farmers representing 16 commodities gathered in Montgomery Feb. 6-8 for the Alabama Farmers Federation Commodity Organizational Meeting. They heard industry updates, learned about cutting-edge technology and elected leaders to state commodity committees. New committee members were elected for 16 state commodity committees, which are responsible for reporting on agricultural issues and concerns and helping establish the Federation’s governing policies. Those committees are: Bee & Honey; Beef; Catfish; Cotton; Dairy; Equine; Forestry; Greenhouse, Nursery & Sod; Hay & Forage; Horticulture; Meat Goat & Sheep; Pork; Poultry; Soybean; Wheat & Feed Grains; and Wildlife Resources. 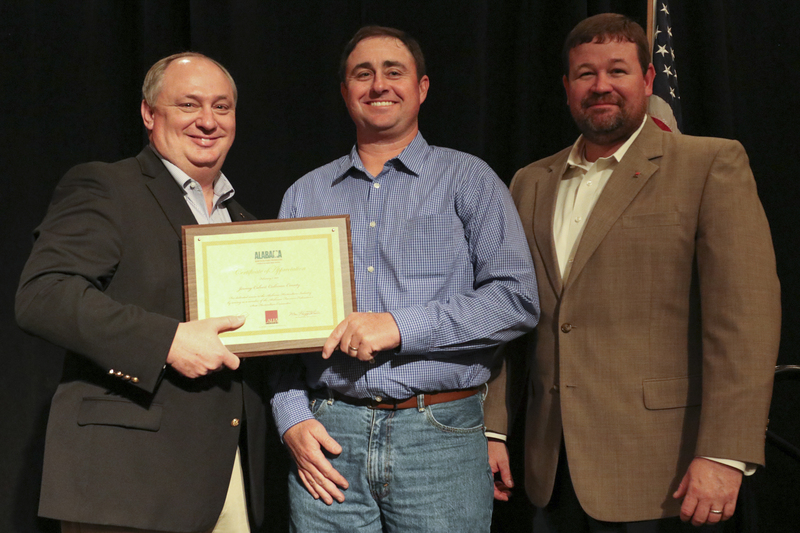 Cullman County's Jeremy Calvert was recognized for serving the maximum nine years on the Alabama Farmers Federation State Horticulture Committee. Cullman County's Tim Donaldson was re-elected chairman of the Alabama Farmers Federation State Pork Committee. The Federation also represents peanut farmers through the Alabama Peanut Producers Association, which held elections during the group’s annual meeting Feb. 8 in Dothan. Lunch on Feb. 6 also included two special presentations. The Alabama Wheat & Feed Grains Producers presented a plaque to Dr. Kathy Flanders, who retired in January from Auburn University and the Alabama Cooperative Extension Service. Cherokee County farmer Matt McMichen also received a $10,000 check from the Alabama Soybean Producers for winning the 100-Bushel Soybean Challenge.